NURSE, midwife and rural health researcher Helen Haines today confirmed her commitment to the consultative, empowering approach to community representation established by the Orange Independent movement and two-term Independent Member for Indi Cathy McGowan AO MP. Dr Haines was chosen at a meeting of 200 Orange Independent supporters in Benalla on Saturday to succeed Ms McGowan as the next Orange Independent candidate for Indi. “In the past few years the political parties have shown themselves to be more interested in leadership challenges, infighting and scandals than in actually representing the people who elected them,” she said. “But six years ago, we in Indi made a different choice: we elected Cathy McGowan who has spent every moment of her time in office working solely to listen, represent and advocate for the people of Indi. “Cathy has shown that politics can be done differently and she has delivered incredible results for Indi. But there’s more to be done and I am humbled to put myself forward, and if chosen by the people of Indi, to carry on that work. “I love this region and I care very much about the people who make these communities their home. My home. “As every nurse has, I have been by people’s bedsides at some of best and worst points in their lives. In these times I have seen the very real impact that public policy decisions made by government can have. Dr Haines has lived and worked in Indi for 32 years, as a nurse and midwife in Chiltern and Wangaratta and now as a rural health researcher with the University of Melbourne’s Department of Rural Health at its Northeast Health Wangaratta campus. “Indi is so full of possibilities,” she said. Dr Haines grew up in a south-western Victorian dairy-farming family and attended Eurack’s rural state school of just 12 students before going to secondary school. She said her own experience was that education delivered opportunities and enabled young people to pursue their dreams. “Opportunity starts with education and in Indi we are well are below the state average,” Dr Haines said. “Barriers to successful education begin a lot earlier than at year 12: we desperately need better investment in early years and post-secondary education.”. Dr Haines said she was also deeply passionate about broadening the scale and scope of health services available in Indi’s communities. “As a country nurse and midwife who has cared for people through the most vulnerable times of their lives, I have become a walking billboard for improved access to lifespan healthcare for our communities,” she said. Dr Haines said championing local renewable energy projects was a once-in-a-generation opportunity to build the regional economy. “Climate change isn’t only a crisis; it’s a once-in-a-generation opportunity to rewrite how the economic pie is divided between the cities and the regions,” she said. Dr Haines also said the values expressed in ’The Indi Way’ of community representation had been inherent in her life. “The values of respect, inclusion, diversity, listening; of recognising the power within communities – these are the values by which I’ve lived my life,” she said. 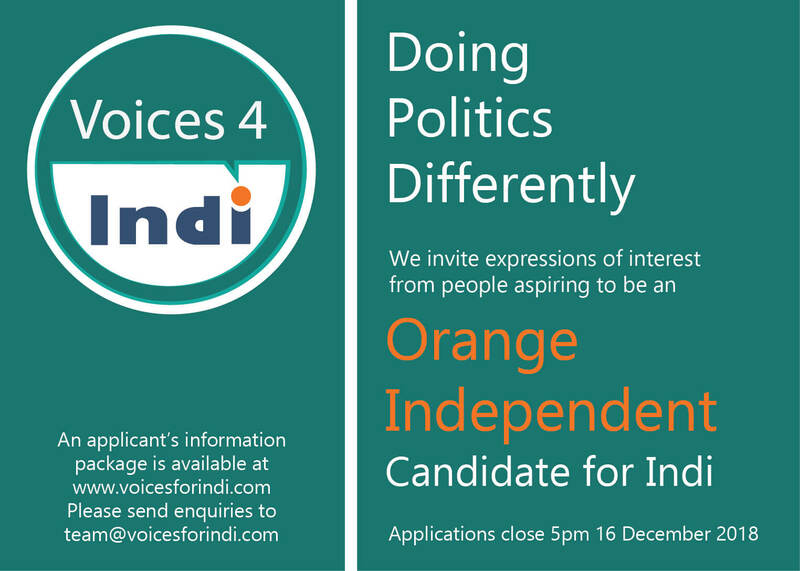 Helen Haines selected by Voices for Indi forum as next ‘orange independent’ candidate for Indi. Helen Haines, a nurse, midwife and public health researcher from Wangaratta has been chosen by a Voices for Indi forum to be their next independent candidate in Indi. Over 200 volunteers from Cathy McGowan’s past election campaigns selected Haines, 57, from a panel of three nominees. The first of its kind process put candidates through six hours of questioning and deliberation. The decision was reached by consensus of all 200 participants. Helen will be available for comment with Cathy McGowan MP on Monday at 10am in Wodonga. “I’ve lived in the north east for 32 years. I have raised my family here and have spent my professional life fighting to improve the quality of healthcare in our region. If I earn the support of the voters of Indi, I will be ready to take that fight to Canberra. “We’ve seen over the last six years in Indi the huge difference it makes having an independent voice in Parliament. Cathy has delivered incredible results for Indi. But the work has only just begun and we can’t afford for the seat to revert back into the hands of the major parties to be ignored once more. 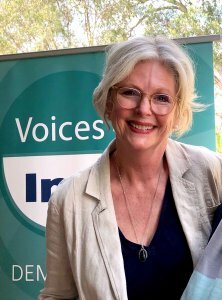 VOICES for Indi (V4i) has brought to fruition a rigorous 12-month planning process that has enabled Orange supporters to decide the future Orange Independent candidate for Indi, resulting in Wangaratta’s Helen Haines accepting the invitation as the candidate. V4i spokesperson Alana Johnson said up to 200 Orange supporters came together in Benalla on 12 January, in the heart of the electorate, to determine by consensus who would be the next candidate. Participants engaged in a deliberative process that involved listening to three impressive applicants – all women – and assessing their suitability through a series of collaborative decision-making exercises. The assessment measured the applicants’ skills and strengths against those that Orange supporters in a V4i survey in November 2018 identified as essential. These were honesty, integrity, empathy, respect and resilience, and the ability to communicate, listen, negotiate, engage and lead. Alana said the Forum had been a powerful community-driven event that stemmed from more than 12 months of intensive planning and consultation. “This rigorous process has engaged people from every Indi community and has demonstrated, again, V4i’s commitment to doing politics differently,’’ she said.